"Thank you for submitting. I feel kind of offended by this submission... I'm not sure if it is a serious track/video or if you have some sort of specific motive with this... but just the mere fact that you decided to submit to our blog without checking out the stuff we usually post shows how serious you are about it all... especially that you spent $ to buy premium credits to submit this. Good luck"
I just wanted to say "hi" and thank you for the explanatory comment regarding you refusing my submission a couple of hours ago. I just wanted to make clear that no one intended to "offend" you. My "motive" was to share new music with a site that's purpose is to help expose music and artists to the public. This was a "serious" submission that from reading and looking at your site and profile I thought you might be interested in (see the accompanying screen capture with your "about info"). As a professional in the music business with 30 years of experience, I consider this submission "quality content." Perhaps you don't understand how it might be "offensive" to me to infer otherwise. The song is written and performed by and from the point of view of a woman who has been objectified by the music industry. This song is her taking the "B" word (used to diminish strong women), and using it to fight back. Here is a video of Jacqueline van Bierk where she discusses the making of this song and this very point. I am also amazed that the meaning seemed beyond a site dedicated to exploring and sharing music. Maybe the "B" word and "S" word are too explicit for your tastes but there wasn't any mention that you were shy of explicit content in your "about" information. At least here in the USA from a cursory google search the "B" word occurs in over 172,000 news stories from major news and network sources as well as appearing in titles of major network show episodes. Beyond the title, the "S" word is used in the song, but it is used in a commonly expressed colloquialism. Explicit language is language. Drawing a line in the sand over "words" that are common in everyday language (as well as in art, movies, music, etc) is fine if you let others know up front that you are easily "offended." I think it is only reasonable that if your tastes are easily offended, that you should make is clear on your "about/submission" information. Forgive me if I am misinterpreting your comments, but when music criticism becomes so PC that you can't see past the language to understand the message - IMHO something is very wrong. UPDATE (7/26/16): I got a messenger message on Facebook from this blogger - which I have found out acts somewhat like a snapchat. After I had glimpsed at it, since the gentleman in charge of the blog wasn't a "friend," Facebook erased it. I an guessing if you get a message from someone and don't approve them as a friend immediately - bang it is gone!? From my memory (I could have the nuance of his meaning wrong) he gave me permission to post his comment here (would be happy to- sigh! ), he was saying he stood by his comments, and wondered what other bloggers had said. This was my first go round with attempting to work with music bloggers and I have found that they tend to have a bit of a laser focus on what they like and what they don't. My issue with that is that 95% of them do not do a good job describing what their preferences are. So you might end up submitting something that, from looking at their blog, and it's "about" page, might seem in the "ballpark," but ends up being "not so much." For instance when I see a lot of "indy" artists on a blog, I figure they could appreciate a single that is a bit "out of the box." But like anything else, indy music seems to have become a bit of a getto where (I could list them here, but I won't) certain conceits, looks and sounds. After 30 years of writing music, dealing with actual music journalists, labels, publishers, etc. I have the background to state that many music bloggers are in the bush leagues as far as taste and understanding of culture and music. Note to music bloggers - don't tell me about my "production" or mix. I am a seasoned pro. I have been writing, recording and releasing music of varied styles since before your daddy was born. My mix is exactly what I want it to be and my mastering was done after going through 8 revisions with an expert in Denmark that I tracked down due to his sound. 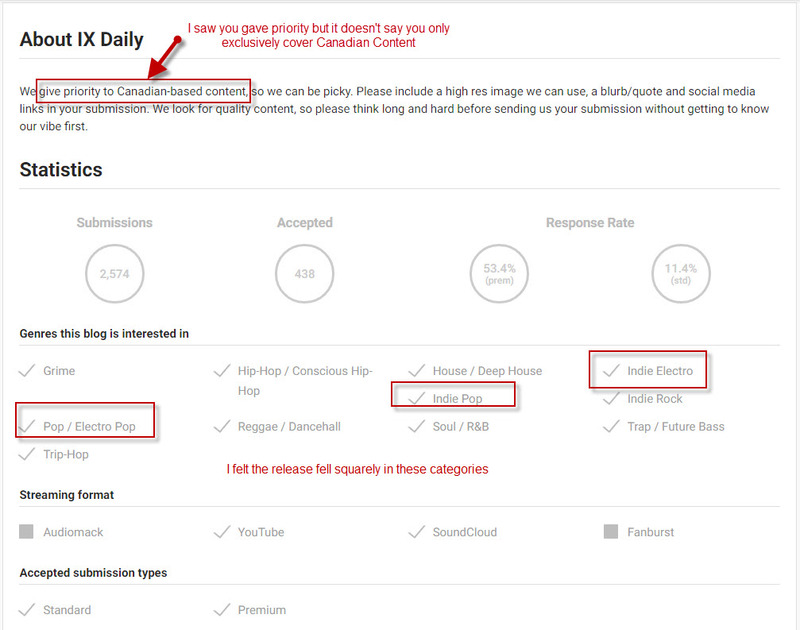 A bit of a warning to artists, if you submit to music bloggers (submithub.com is what I used) and give them something bold, fresh and new - don't be surprised if they don't understand or misinterprete it. For this single, I am finding that fans that "get it" seem to be women, feminists and African Americans.